I sat, enveloped by the clinic’s dusty walls and chalky smell. It felt as if a fog of gray haze had descended over the building and muted the surrounding colors. Two plastic chairs were positioned next to the door, with one single picture of skeletal anatomy hanging above them, forcing the makeshift closet to resemble an exam room. The door opened briefly, revealing the sounds of children crying, hens clucking and one volunteer’s broken Spanish struggling through the midst of everything else. A woman walked in. An array of orange and purple triangles popped out from the pattern on her shawl, a stark contrast to the dirt floor and lackluster walls around her. Her long black hair, a stunning mixture of countless shades, was plaited in a perfect braid flowing down her back. Her heavy eyes remained glued to the floor as she mumbled polite answers to each of my questions. I tried to make out their color – a curious combination of green and brown that evaded my glance. I had been staying in the mountains of rural Guatemala for a week. Each day, I would arrive at the clinic to find a line of patients extended down the street. Most, like this woman, were indigenous people who had traveled miles from their homes, dressed in meticulously hand-woven garments, to see a doctor for the first time. Many came with maladies you might encounter anywhere — the common cold, gastroenteritis and rashes. I will always remember the simplicity of my interaction with this woman. It was a particularly hot day, and I had been seeing children with parasites and adults with unmanaged hypertension all day. This elderly woman’s malady was different. I started with my standard opening to every patient interview, asking her to tell me the story of why she came in. She responded with the simplest of answers, “Estoy triste” (“I am sad”). She stared at the floor as I awkwardly wondered whether she would delve into a story of diarrhea, cough or headaches. Finally, realizing she was not planning to continue, I asked, “Porqué?” (“Why?”). She described how she no longer had the energy or desire for things she once enjoyed. Her children had all grown up and moved away, and nobody visited her anymore. She was lonely. I could have walked a few steps from my house in Boston and found a nearly identical patient. The universal need for healing is what originally drew me to medicine. Disease and pain are shared vulnerabilities that transverse social, cultural and economic boundaries. Depression may be treated differently and have varying definitions. Yet the underlying loneliness that drove this woman’s despair is a language we all speak, whether we just moved away from home, lost a pet or ended a relationship. Through all the studying, training and long days in the hospital, I have come to realize that this aspect of medicine makes it so difficult, yet also so rewarding. The patients who keep me awake at night, the ones I remember with tears, are those whose pain is universal. Giving a rare, devastating diagnosis is unpleasant, yet the adolescent with the same struggles as my sibling, or the elderly woman whose memory loss resembles my grandmother’s, are the most lasting heartaches. At the same time, witnessing a pain you or your loved ones have suffered makes the job of a doctor so special. 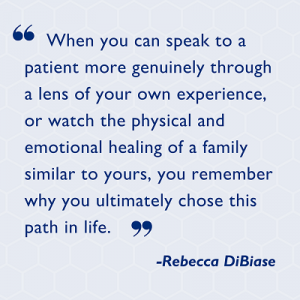 When you can speak to a patient more genuinely through a lens of your own experience, or watch the physical and emotional healing of a family similar to yours, you remember why you ultimately chose this path in life. At these times, the rediscovery of universal human experience sends you home smiling. Eventually, I simply placed my arm around this woman’s shoulders and let her cry.